One of our most popular lights is now in a chandelier!! 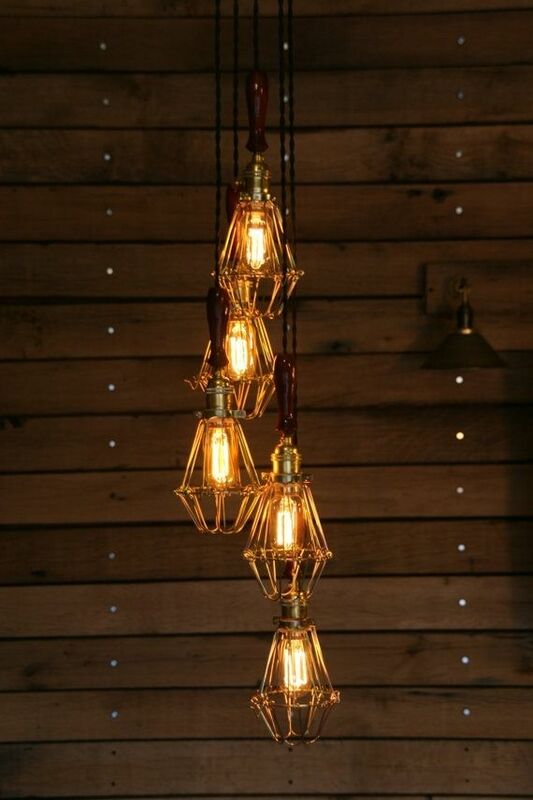 These lights clustered together or staggered make a great chandelier!! Each light strand comes with a Brass Socket and a Rotary Knob Switch. Each can be turned on or turned off individually. Cords are new, reproduction, vintage style cloth covered cords. Comes with your choice color of cord and canopy. If you have another color canopy in mind, email us, we might be able to customize it for you. Each light strand will hang 3' from the ceiling to the bottom of the cage, that way our customers can stagger them or cluster them to their own liking (very easily done). If you need it to hang longer, we can do that for $5 per extra foot (example - you want it to hang 4' from the ceiling instead of 3', then we would add $5 to your order - please email us for a custom order). UL Listed Socket rated at 250w/250v. Wire is rated up to 300v.